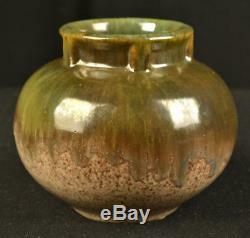 This is an antique Fulper art pottery vase, fresh from an old estate. This has a green flambe glaze over powder brown. This was made by Fulper Pottery, and is in pristine original condition. This has the rare early Fulper mark, and was glazed carefully around the mark. This measures about 5 1/4" high, 3 1/2" wide rim and 5 1/2 wide. This is in good condition. This weighs about 2 1/4 lbs before packing. Please wait for your invoice before paying. On expensive fragile items, we may need to double box them. This will require additional labor and material costs. EVERY ITEM IS GUARANTEED TO BE THE ONE SHOWN IN MY IMAGES. I sell mostly antiques and collectibles, which will usually have the normal wear that you would expect to occur from normal use and age. I do my very best to accurately represent each and every item I sell. I do not sell fakes or reproductions of any kind, unless they are clearly described as such. I guarantee every item I sell to be authentic, and to be made in the time period as represented. I welcome input from dealers and collectors in specialized areas, to help insure my listings are complete and accurate. If the listing ends over the weekend, you will normally receive an invoice on Monday. You will need to save the box and packing materials to show the shipper. This is the proof that they require, so if you discard the packing materials, your claim may be denied. Shippers do not accept parcels packed in damaged boxes as a rule, so damage is normally evidenced by damage to the box. The item "ANTIQUE ARTS CRAFTS FULPER POTTERY VASE #531 GREEN FLAMBE SIGNED RARE EARLY MARK" is in sale since Monday, July 30, 2018. This item is in the category "Pottery & Glass\Pottery & China\Art Pottery\Fulper". The seller is "finearts29mv" and is located in San Diego, California. This item can be shipped worldwide.